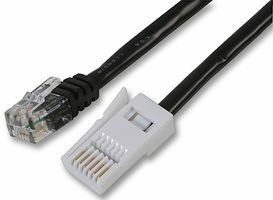 This lead can be used to connect an analogue modem or an ADSL modem/router directly to a BT socket. Useful for dedicated ADSL extensions where no telephone is required (so no filter) so a BT to RJ11 rather than RJ11 to RJ11 lead is required. Also suitable for connection of Sky boxes to the telephone line for interactive services & FAX machines (remember those?!). Lead is 3M length.